Here's a hard-to-find part for vintage Speed Queen clothes washers. 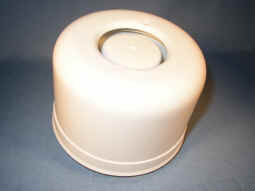 This softener dispenser fit on the top of agitators on the 'NA', short-post 'BA', and 'AA' models (with small or no ag. nut). This is a nice design - simple and easily disassembled for cleaning - for these great old washers. A brand new OEM part, and we're not sure how much longer - or IF - we can get more, so hurry!